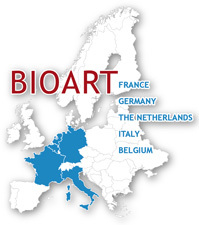 The BIOART research and training programs are taking advantage of the expertise, complementarities and networking potential of its eleven partners: ten full partners (with three private organisations bringing strong intersectorial perspectives) and one associated partner. The biomaterial Science and technology group of the University of Twente is one of the leading experts worldwide in this field. The group participates in MIRA research institute of Biomedical technology & technical medicine. Over 600 papers in high impact journals & 30 patents. Key competences and facilities: Complete infrastructure for preparation & characterization of membrane & modules devices including casting & spinning machines; DSC; TGA; SEM;AFM, Raman; Complete biochemistry and tissue culture laboratories. Université Paul Sabatier Toulouse is a Scientific & Medical University. “Laboratoire de Génie Chimique” is one of its largest Departments in the field of Engineering. LGC’s staff involved in the present project are authors of over 150 research papers. Key competences and facilities: Expertise in Mass transfer through membranes – membrane fouling – Biomolecules separation fractionation. Facilities in Membrane preparation–proprietary advanced membrane characterization methods and micro-channel devices with on-line data acquisition. The Department of Pharmaceutical Sciences of the University of Utrecht is responsible for teaching and research in areas whith a focus on medicines. Students train as pharmacists and also in pharmaceutical research. This field of study interfaces with medicine, veterinary medicine, biology and chemistry. The Department of Pharmaceutical Sciences cooperates closely with these faculties and departments in Utrecht Life Sciences. -Expertise in design and implementation of in vitro human cell culture dynamics in the framework of kidney substitution. -Strong background in kinetics of endogenous and exogenous compounds and their waste products, in vitro and in vivo. -Fully equipped cell culture rooms, molecular biology and biochemistry labs, high content imaging facilities, and mass spectrometry as core technology for metabolomic profiling and biomarker development. UTC aims at fostering the links between educational services in engineering sciences and actual industrial needs. CNRS UMR 6600 is a research laboratory of biomechanics and bioengineering of UTC, fully part of CNRS (French National Research Council). Staff involved in the present project are authors of over 80 research papers. Key competences and facilities: Expertise in design and implementation of models for in vitro cell culture dynamics in the framework of target organ substitution. Bio-artificial organ research, using micro-fluidic biochips, has a strong on-going focus on in vitro cell culture models. Facilities in culture rooms fully equipped. ITM is a multidisciplinary institute based on backgrounds in chemical engineering; process engineering; chemistry; biological science; food science; material science and physics. At present 10-15 external researchers per year visit the Institute and collaborate to its research activities. The team has 676 papers and 24 patents. Key competences and facilities: Expertise: a) Biocompatible and cytocompatible synthetic and biodegradable membranes; b) Bioartificial liver; c) membrane bioreactors the expansion and differentiation of stem cells; novel strategies to improve cell-biomaterials interaction. Facilities: Laboratories for cell culture, biochemical analysis, membrane preparation and characterisation, molecular dynamics and membrane reactors and membrane processes. The centre coordinates the life science and molecular medicine related research at the University of Leipzig and provides excellent lab facilities and infrastructure for molecular and cellular techniques. 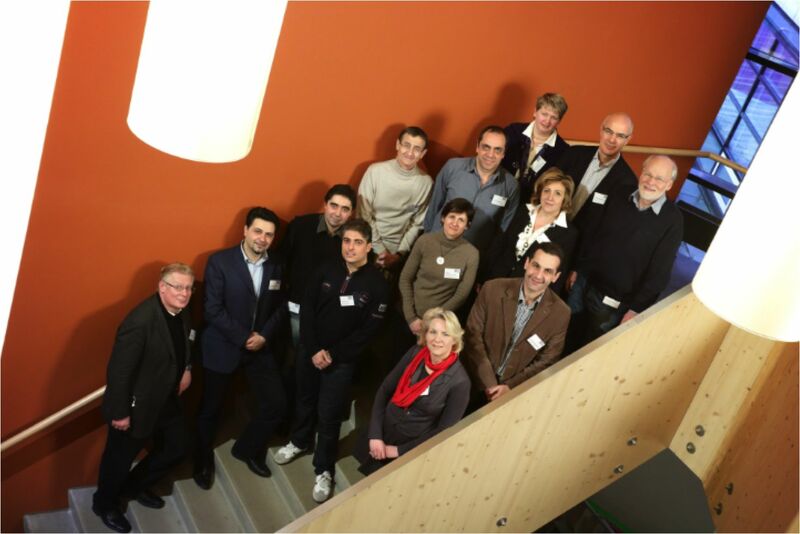 The partnering “Chair in Cell Technology and Applied Stem Cell Biology” has been founded as a part of a major European biotechnology initiative and is the only dedicated German site of a chair in applied stem cell biology. Key competences and facilities: Expertise: in technical design and optimization of wide range of bioreactors Proven records of successful preclinical survival benefits to new porcine hepatectomy model using our flat membrane bioreactor based bioartificial liver. Facilities: Flat membrane Bioreactors, miniature bioreactors, GMP clean room facility and all sophisticated instrument for biochemical and molecular experiments. Research and training activities on membrane science and technology are developed at the Department of Environmental and Chemical Engineering (DIATIC). DIATIC-UNICAL has a pluri-decennal record of R&D activities in close cooperation with the European Union and other international and national institutions. Key competences and facilities: Expertise in membrane operations for process Intensification, integrated membrane processes, bio- and photo-catalytic membrane reactors, cell-culture membrane bioreactors, advanced analysis and control of multi-phase systems and membrane reactors, reactor fluid-dynamics. Facilities: about 1,500 m2 of laboratory space, 40 R&D staff, almost all research equipments available within the UNICAL Campus. The Residence Centre on Campus provides accommodation and leisure facilities to about 5,000 students and post-docs. EXCORLAB is an SME specialized in laboratory & pre-clinical, clinical studies with artificial kidneys, artificial lungs, adsorbers, apheresis devices & new development products. Key competences and facilities: Expertise: Assessment of in vitro haemocompatibility of medical devices for extracorporeal circuits (coagulation, complement & cell activation), animal model of dialysis (sheep), clinical studies of medical devices with & without CE-mark. Hollow-fiber bioreactor design & testing (e.g.bio-artificial artery) & performance testing of all kind of membranes in medical applications. Facilities: Clinical & biochemistry, cell culture of primary smooth vascular cells, endothelial cells & cell lines (e.g. monocytic), neutrophil & platelet activation, isotope laboratory for protein labeling studies. GVS S.P.A. is of the world's leading manufacturers of injection-moulded plastic filters and components for various sectors (e.g. Medical, Automotive, Laboratory, Pharmaceutical) and also manufactures membranes. Key competences and facilities: Expertise: filter manufacturer. Membrane manufacturer. Filtration media surface characteristics control and functionalization. Facilities: Five laboratories out of which the one in Bologna is the biggest and fully equipped to characterize biomedical filters and filtration materials. Eleven manufacturing sites located in Italy (2), UK (2), Brazil (1), USA (3), China (2) and Romania (1). Bionethos Innovation GmbH (founded in 2007) is focusing on research and development in the field of regenerative technologies. autologous implants whose later application has to be carried out under GMP conditions. Bionethos possesses the Intellectual property which is needed for this project. Facilities: Research entrepreneurial skills and intellectual property awareness to early stages researchers in the field of medical devices and medicinal products and their economic globalization with special importance of creation, protection and commercialization of intellectual property. * European Membrane House a.i.s.b.l. The EMH is the Durable Integrated Structure (DIS) created on request of the EU as a main outcome of the Network of Excellence NanoMemPro. EMH is a non-profit international Belgium association, aimed at enhancing industrial implementation of membrane-based technologies. Key competences and facilities:Lobbying at the European and national level, setting up of new projects related to membrane technologies, membrane project management, dissemination of knowledge.